INADVERTENT INGRESS OF HEAVY FUEL OIL INTO MARINE DIESEL OIL TANKS. WHEN NECESSARY, ARRANGEMENTS ARE TO BE MADE FOR COOLING THE MARINE DIESEL OIL FROM ENGINE RETURN LINES. · TWO FUEL OIL SERVICE TANKS FOR EACH TYPE OF FUEL USED ON BOARD NECESSARY FOR PROPULSION AND VITAL SYSTEMS, OR EQUIVALENT ARRANGEMENTS, ARE TO BE PROVIDED ON EACH NEW SHIP, WITH A CAPACITY OF AT LEAST 8 H AT MAXIMUM CONTINUOUS RATING OF THE PROPULSION PLANT AND NORMAL OPERATING LOAD AT SEA OF THE GENERATOR PLANT. ONE MARINE DIESEL OIL SERVICE TANK WITH A CAPACITY OF AT LEAST 8 H AT MAXIMUM CONTINUOUS RATING OF THE PROPULSION PLANT AND NORMAL OPERATING LOAD AT SEA OF THE GENERATOR PLANT AND OF THE AUXILIARY BOILER. 4 H AT MAXIMUM CONTINUOUS RATING OF THE PROPULSION PLANT AND NORMAL OPERATING LOAD AT SEA OF THE GENERATOR PLANT AND OF THE AUXILIARY BOILER. A SLOW-SPEED TWO-STROKE DIESEL IS USUALLY ARRANGED TO OPERATE CONTINUOUSLY ON HEAVY FUEL AND HAVE AVAILABLE A DIESEL OIL SUPPLY FOR MANEUVERING CONDITIONS.BUT BEFORE THAT THE FUEL HAS TO BE COMPATIBLE WITH THE MAIN ENGINE. THE PROCEDURE TO MAKE THE FUEL GOOD AFTER DECIDING WHICH ONE IS GOOD TAKE A LONG TIME TO PROCESS. 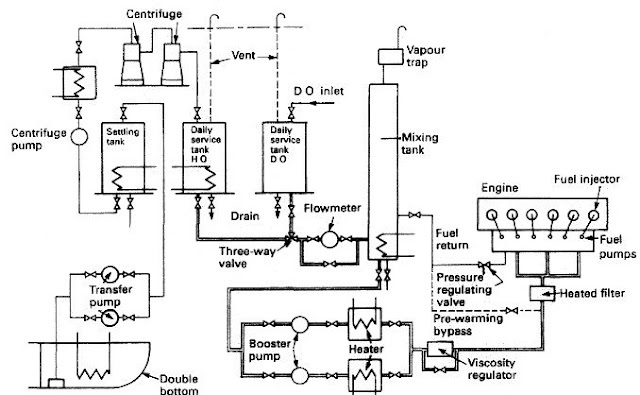 TO CHOOSE THE RIGHT FUEL FROM BUNKERING TO FUEL INJECTION IN THE ENGINE CONSIST A LIST OF PROCEDURE WHICH CAN BE FOUND IN THE BOOK ATTACHED BELOW. AND SOME GENERAL QUESTION TO ENHANCE YOUR MIND POWER.